This Month we will be deepening the pathways of unity within us as the truer natures of ourselves rise into 2019. We will be setting the field of 2019 both individually and collectively. It is now undeniable that you are part of new futures rising. What was once a future prediction is now an imminent actuality. In the shifts we are in, we often misinterpret our emotions, our circumstances, and our bodies. There is an agitation because we cannot seem to see a duplication of what we are experiencing inwardly. It is because we have not had a way to track and register what is moving from the invisible to the visible. New actualities are rising but not in the mindset we have been entrained to perceive through. It is so exciting to be me right now. It is so fun to see the pleasant shock that the language of your psyche can provide you. It is like standing in an amazing forest and finally knowing how to recognize trees. The work of a seer is to realign you with what is rising within you so that you are not thwarted by misinterpretation. What we held reality to be is no longer valid. I have been amazed at what I am seeing in Consults and in Activations. Once I language what is present, the fog of misinterpretation falls away and the clarity of what is actually happening rises. You just haven’t had its language. It is my pleasure to provide that. It has been extraordinary to be in the consults and in the activations. There is such a shift internally. The Dialogues are the most challenging because we must be about to massage our neural pathways through listening and questioning to get the thoughts that register what is actually happening and not get lost in the archaic interpretations of the past. Moving past misinterpretation to really being aware of what is now occurring requires that we exercise our thought apparatus, so we can think what there is to think now. I am really good at getting people to think. Thinking is my expertise. We can no longer be lost in trying to figure out what to think. We must be able to open our minds up into the new structures of reality that are rising. Thinking what is ‘yours to think’ is imperative. This month the Dialogue will be my yearly End of the Year Message to prepare you for what to expect in 2019. There is such a feeling of partnership in the work now. You are awakening. There is an awakening surge occurring for you to take advantage of. So many more of you are part of a new system of consciousness, a new paradigm. 2019 is when you do the work of rooting it into physical actuality. I found it strange this diary entry this morning. There is a compelling interest in making sure I share outside the lines these days. I am grateful for the way in DreamTime an obtuse relationship with Creation is occurring. “What a strange sentence, Tantra?” you might say. I get that, but whatever is happening in DreamTime is related to a very important Timeline we are in during these days before us. Not just myself and others, but the entire planetary human system. The obtuse works in the greater meaning of things and their role in larger matrixes that form the human experience of reality. You cannot use the dictionary definition of obtuse because it misses the point and yet in a way it does not. Basically, it says that the person’s speech must be dumb or stupid because what they are saying doesn’t make sense. My question is what is supposed to be making sense? Is it possible that what we have been making sense of has been keeping us in a box dimensionally challenged like a triangle that has the same degrees on all three sides which is different than an obtuse triangle that has more than 90 degrees and less than 180 messing up everything? So in a triangle with three 90-degree angles, you can have only one obtuse angle. Perhaps the obtuse carries a space between-a reality not visible to how we have been trained to perceive. Maybe we should be more obtuse these days. What struck me is the obtuse triangle is the shape used in trusses for bridges and the roof on a bridge. The engineering definition is a truss is a structure that consists of two-force members only, where the members are organized so that the assemblage as a whole behaves as a single object. Isn’t that interesting? Doesn’t a woman I know and love who works in the higher regions talk about assemblage points? Isn’t it interesting that assemblage structures may not be the way we thought about structure? 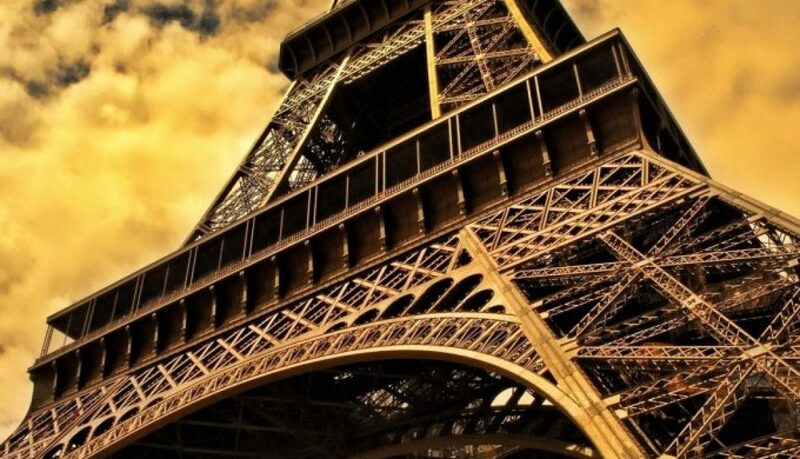 An extraordinary the strength of the obtuse for example of this is the Eiffel Tower. No one would have called Eiffel stupid or dumb! Oh wait a minute, they did! Have you ever been on the Eiffel Tower and felt the energy there? You do not feel boxed in, I promise. You feel safe in the wind. Hum? “Is it not true that the very conditions which give strength also conform to the hidden rules of harmony? … Now to what phenomenon did I have to give primary concern in designing the Tower? It was wind resistance. Well then! I hold that the curvature of the monument’s four outer edges, which is as mathematical calculation dictated it should be … will give a great impression of strength and beauty, for it will reveal to the eyes of the observer the boldness of the design as a whole. I am grateful for my journal as this also gives me an obtuse way to share with others, so I am not trapped in trying to teach or explain. I can be in a direct experience that I and others are aware of happening and those that are drawn to read my words can reflect on their own obtuse relationship that is probably forming with Creation. Now the Telecalls are organizing to be part of the operating activity of Creation for the next few months. From the 13th of September to the 11th of October, I and others will be traveling first to Ireland, then to Glastonbury, and then to Damanhur, Italy. I began this operating relationship with the powers and forces of Creation in Mt. Shasta in what was called the Mimzy Project April 4th, 2010. In the etheric plane where we are never separate, we will become part of an activity occurring in Creation. In the ethers, new gathering points of unity, metapoints, are rising. As in the days of old, this requires human participation. After all, what is rising is rising as part of what it is, in truth, it is to be human. Once human beings and Creation existed in unity and created through their energy fields templates of new worlds. This activity of human beings and Creation is in a period of reconciliation and our participation supports that. The community telecalls will be part of that journey. When I set up the Activations and other Telecalls, I listen to the greater whole of which we are a part. My particular paradigm of Spirit I call the Realm of the Beloved. This is a landscape of consciousness where humanity is part of a greater scheme of things as Beloveds of Creation. The human beings whose existence I am a part of love the earth, love life, love rediscovering themselves and others as a unique and essential part of futures forming. ” ‘We’ are remembering what it is to be loved and to love.” Jim, one of the Architects in the Spirals of Being and a facilitator in the Unity of Care Community Telecalls said. Mostly, after years of being part of the architecture of Creation, I am not startled anymore when I come into an Activation and see what my meager words of an invitation really were about. The day I scheduled the date of this Activation, I began to dream long ‘other reality’ dreams. These dreams were not like any dreams I had ever dreamed before. It was as if the dreams were existing side by side with my present reality, but only accessible in their purity at night. A door opened at night so that my system, my heart, my spirit, me myself could dwell without disturbance and live in a way that is not yet lived here but is being sorted out in DreamTime. After the call, I attempted to watch the news and fell asleep in the chair. This is something I NEVER DO. I made it to bed with Lily joining me. I had decided not to send out a reminder for the Activation because I just didn’t know what to say. Saying, “Ignore what you think is reality and listen to what is forming within,” seemed pretty vague. So many people don’t seem to be able to do that yet and seem to still be caught up in the minutia of the debris field that looms so strongly now in this reality of separation we were born into. I fell asleep at 7:30 pm and woke up at 3:30 am. The dreamscape I had been in was even stronger than the night before. I had been suspicious of the dreams, in a way I can’t explain, were growing stronger. Last night, it was undeniable. I was being strengthened to transmit in the Activation Wednesday night what is beyond words, beyond comprehension, a structure of reality that is now present in human DreamTime. I understand it is probably hard for your present mindset to comprehend this. What I am trusting in your Mind of Creation that now rising amide the cacophony of outworn thinking. Your mind of creation carries the perception of the formless nature of being you are that moves with the greater Creations of you are part but cannot yet perceive – what I term the MetaSelf. That said, I started writing this an hour ago because the structure of Reality piercing this veil of separation you live in that is now collapsing has now activated me to transmit. I suspect that the result will be a more active Dreamtime, so your system can acclimate to registering perceptions of unity now rising within you. It is your perception and how your systems register reality that is being challenged. Part of your system is no longer registering the reality of separation you were born into and is now registering the realities of unity that you carry within you – the Original Design of the Original Intent here.